New Program for CNC Machine manufacturing. Late last year we have finished making our first self-built CNC machine at 4m x 2m x 0.3m - this one in solid steel of tooling grade with tolerance up to 2/1000mm. It is now in action making all our surfboard / windurf board blanks and prototyping parts. 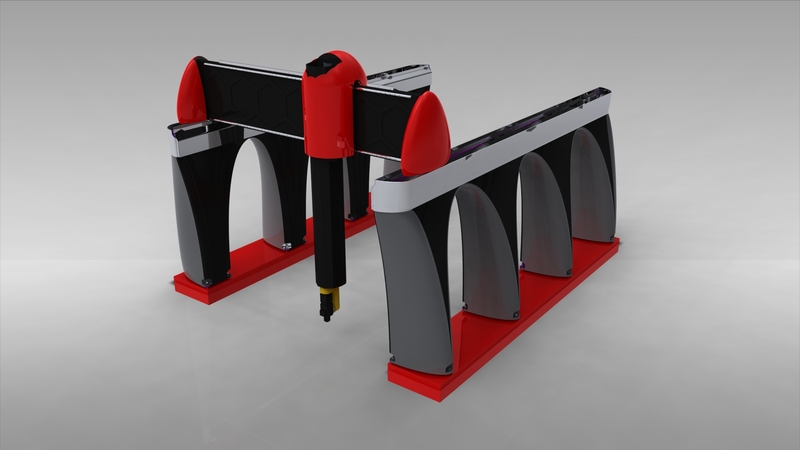 We have finished all designs of our next adventure - a new 5 axis CNC machine measuring 8m x 4m x 3m . This machine will serve to automate all trimming of all carbon parts in our production and large scale prototypes. This machine will be made of mainly composites parts with a lot of carbon for the rigididty and lightweight for shipping and transportation. t is designed to outperform existing metal CNC machines in all aspects - tolerance, shipping, installation, operation, low energy consumption, fast turn around time for production, as well as price. 50% of all components imported from the USA and Japan are in house. We are starting to prototype the composites parts this month. The machine will be put together within the next 3-4 months. We also plan to build specific machines to cut all materials for production and even do polishing and painting. It will take about 18 months or so to upgrade all of our production to this high level.